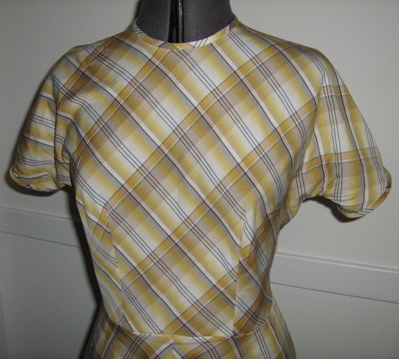 I want to make this again as it was fast (I cut it out in about an hour, and it took about three hours to sew; if I weren't doing plaid it would probably take less time) and fairly easy, and fun to wear. 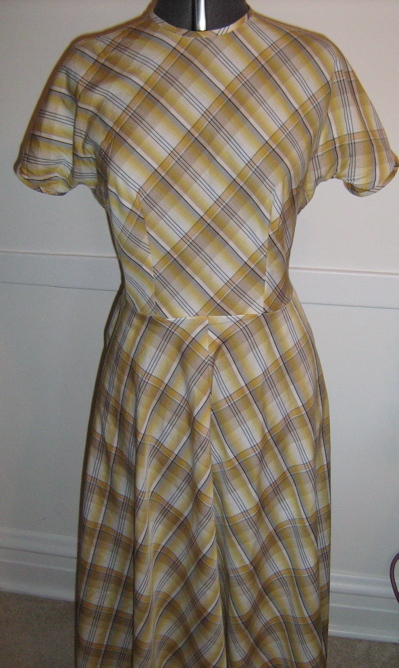 I cut the front bodice on the bias, so that the plaid would purposefully not match at the waist seam. I think it would look better with a belt (I'm planning to try to find the gray patent belt Summerset bought at Target for her shirtdress). Other than cutting the bodice on the bias, the only other change I made was substituting a center back invisible zipper (running from about the bra-strap line to 6" below the waist) instead of the side snap placket the pattern calls for. It wasn't fun to set in, but by moving the zipper to the center back, I could put in pockets on both sides of the skirt, instead of the one-sided pocket the pattern allowed. 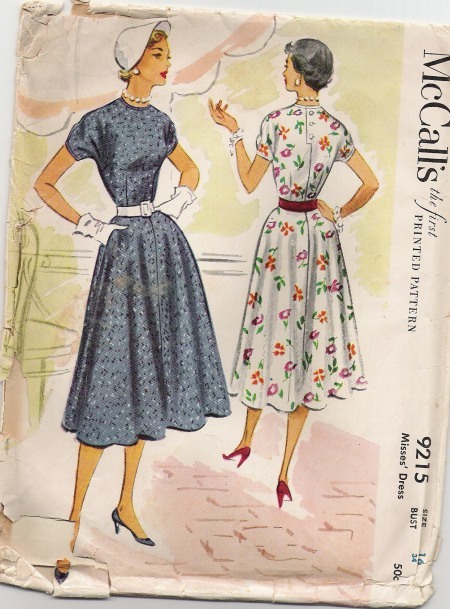 Next time I make this I'm going to lengthen the bodice by about an inch, and widen the sleeve a bit to accommodate my, um, muscular upper arms. I'm also going to try to figure out why the shoulder seam was a bit forward of the top of the shoulder when I was wearing it. Something was pulling, but I can't figure out what! My camera ran out of juice before I could shoot the buttons in the back, but they were just plain plastic yellow buttons, anyway. I could have sworn I had some lovely gray buttons in my stash, but they managed to disappear. The best part of this dress was the fun of applying the bias edging to the neck and sleeves. I love doing that. And although the neck is pretty high, I found it quite comfortable. All in all, it was probably not the Best Idea Ever to make a brand-new pattern (and one where I made so many little changes right off the bat) in PLAID, but, hey, why not? If something's too easy there's no fun in it, right? Ir you ever get tired of this dress, I will wear it for you because that is what kind of friend I am.Love it, MEAN it. Especially the bodice on the bias. Brilliant! Well, I didn’t think I was fond of the yellow, but in the BurdaStyle pic, it looks really nice.”If something’s too easy there’s no fun in it, right?”My sentiments exactly. I do so much better (as far as maintaining interest in a garment-in-progress) when I’m not sure what’s coming next. I must secretly (and entirely subconsciously, believe me) like frustration. Thanks for posting this Erin. I LOVE seeing pictures of finished dresses that were made from patterns someone bought from me. It looks great and I liked the Burda pic with the gray sweater. A thin black leather belt would also look nice with this. You could go all trendy and wear it over your cardigan. I know, I know–trendy. But I’m behind this trendy because it makes use of the only thing I got–a waist.I got a neat light gray herringbone and leather belt from old navy: http://www.oldnavy.com/browse/product.do?cid=37598&pid=522216&scid=522216012$10! It’s a bit wide, though. I love plaid, always have, always will.Great dress! I love it! Of course, I do, it’s plaid! Thanks for the shout-out and I do hope you find the belt at the big T.
The dress looks great on you. The yellow and grey plaid is quite flattering on you. You should wear more plaid.Love my tape measure, by the way. It has a permanent place in my purse. The shoulder seams are probably too far forward because the area from the shoulder to the bust point is a bit too short. The tight arms also contribute to this problem, since the sleeves are sitting a wee bit lower than they would pull if the arms were looser. You are everything I aspire to be in a seamstress: creative, stylish, a wee bit kitschy, and very talented. I really, really like the plaid. It suits the patterns very much. One day I will get over my fear of plaid and totally rock it the way you did here. Two of my bestest friends ever were wandering around that craft fair. I’m so jealous! It sounds like a perfectly lovely way to spend the day. I love the checked material. I have some similar in fine wool bought in China. Yellow is one of my favourites and it looked great with the grey cardie. The reason the plaid is “almost matched” is because the material you have chosen has a nap. In other words it is a “one way” material and has to be cut following the “with nap” instructions. Many seamstresses I find on blogs don’t seem to realise this when cutting out fabric. 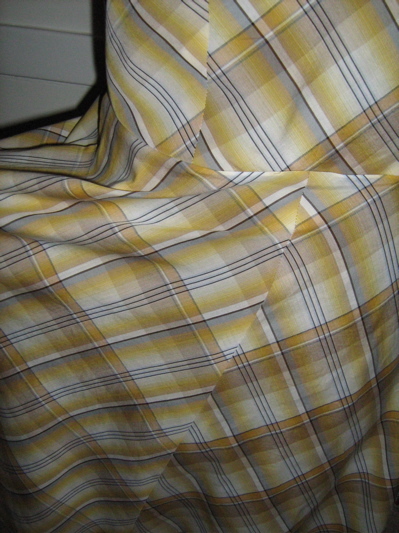 changing the direction of the grain could also change the fit and that might have contributed to the pull you were feeling.this fabric doesn’t have a nap but it is an uneven plaid so that is why the lines won’t line up.This can sometimes be dealt with by using the wrong side of the fabric for half the skirt IF the fabric is a woven plaid. This would not work if it was a printed plaid. Perhaps I used the wrong term when I said the material has a nap. I should have said it is a “one way pattern” in other words you can’t reverse pattern pieces on it and get the patterns to match up. ALL pieces need to be cut with the tops of the patterns in the same direction, in other words it should be cut exactly the same as if you were using velvet with a nap or a mohair material where the material has to be cut in the same direction for it to match up the colour or the “nap”!! !